This is the sttol that was intended to live in the shed at the allotment for rest and contemplation breaks. The wood is re-growth from ash that was coppiced a few years ago to allow more light into the oaks, in view of the likely effect of ash dieback. The wood made most of the design choices ! 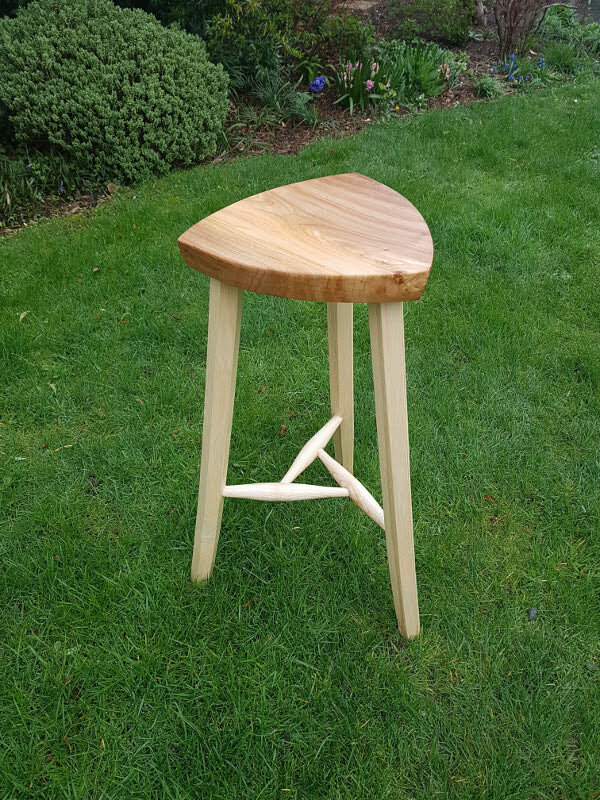 I went to rive it into 4 legs, but the split ran out on one, so electing to be a 3 legged stool. I started to prepare the good 3 for the lathe, got as far as knocking the corners off to make a hexagonal cross section, then realised that the bottom of the trunk had a curve that was going to be too much to allow them to be turned without ending up too thin. I decided to go with the flow and have hexagonal legs, and use the curve to give an outward flare at the bottom of the legs. The remaining bits were enough for the stretchers, but of limited length and with awkwardly placed knots - I worked around them placing the joints between the stretcher pieces to allow me to drill out the loose knots to make the mortices on two of them. The elm seat was a lump which has been lurking for a while in the garage - it was a bit narrow (Dutch Elm disease means it's about as big as are to be had at Wimpole) hence the curve on the edges of the seat to make use of the curve on the outer edges of the board. The shape is a Reuleaux triangle - each edge is a circular arc struck around the opposite corner, and makes good use of the narrow board. Oh, oh, oh ..... WOW! That is lovely CH. Sometimes I think the best designs are borne of necessity. That is so unusual CH and beautiful too - all the more so because of the way you have used the natural quirks of the wood. It most definitely shouldn't be banished to the allotment shed. » Trellises: How Tall is Tall Enough?